Two newly developed high tech print heads in staggered arrangement achieve a maximum speed of 30 sqm/h. Benefit from a fast return on investment due to increased productivity and a very accessible price. Media up to a roll weight of 100 kg is securely controlled. 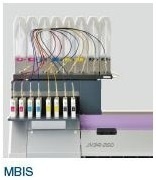 Mimaki’s AMF (*1) maintains optimum tension even on long jobs. 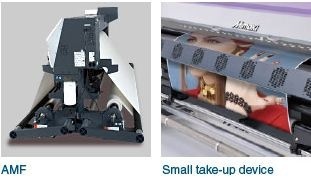 Smaller media are supported by the standard small take-up device that comes with the printer thus enabling full control of all substrates sizes. UISS for continuous printing is standard on JV34-260 machines. The JV34-260 can utilize two cartridges per color in 4-color mode. When the ink cartridge runs out, another cartridge begins supplying ink and helps prevent running out of ink. A maximum of 880cc ink per color can be loaded at one time. With 880cc of ink loaded at one time, a 50m (54yd) roll of media can be printed without interruption. Ink cartridges can be changed during printing. A red light is displayed when a cartridge is out of ink and the machine switches automatically to a new cartridge. Superior adhesion to media and resistance characteristics paired with brilliant color reproduction for high speed printing. Suitable for printing on transfer paper for polyester substrates. Its high density results in excellent and outstanding coloration of the final product. * Ink type must be chosen at time of installation. Sublimation printing corresponds to printing on transfer paper. By producing dots in three different sizes, smooth high resolution graphics are created without a grainy appearance. In combination with the 3 stage intelligent heater, an automatic drying fan is employed for even more streamlined work. Thus even at high-speeds all media is dried thoroughly so that it can be wound up immediately. Head height can be adjusted to either 2 or 3 mm according to the media thickness. For sublimation printing, head height adjustment of either 3 or 4 mm is available(*4). *4 Adjustment needs to be carried out by service personnel. Note: not all ink configurations are available for all models. Check with your representative before ordering.